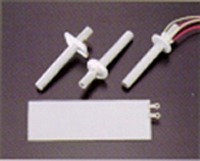 Using an alumina ceramic body in which a heating element is buried then sintered onto the unit, these ceramic heaters can be made lightweight. In addition they excel in chemical resistance and in uniform temperature distribution. Heating elements are embedded by printing resistive elements on alumina sheets (HA-921) and laminating them, and then monolithically baked. Since the resistance wires, which are heating elements, are isolated from outside, ceramic heaters combine excellent insulation properties and chemical resistance, are highly reliable, without wire breakage, and do not age. They can be rapidly heated and manufactured in miniature sizes and at a lighter weight.